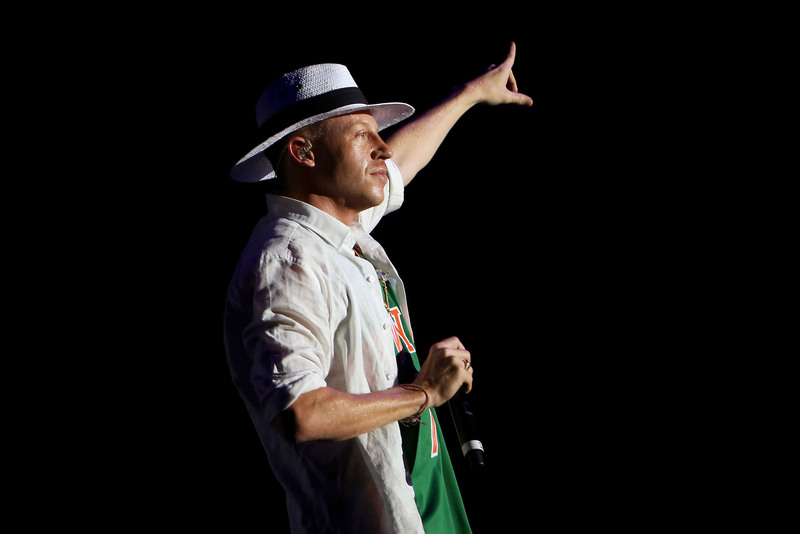 Did Macklemore Dress Up as an Offensive Jewish Stereotype? Just when it seemed we'd heard the last from Macklemore — after he slunk off embarrassed at having "robbed" Kendrick Lamar of his Grammy (but not before making sure we all saw his embarrassment via Instagram) — of course, he's elbowed his way back onto all of our radars with another facepalm-worthy stunt. During the opening celebration for an exhibit titled "Spectacle: The Music Video" at Seattle's Experience Music Project Museum — which features, in part, his smash hit video for "Thrift Shop" — Macklemore treated fans to a surprise 15-minute set. But in order to up the surprise element even further, he did the show in "disguise." And that disguise was made up of a massive, hawkish prosthetic nose, an orange silk shirt, and a black beard-bowl cut combo, looking like a bizarre-o, hirsute cross between Ringo Starr and Davy Jones who's been paid a visit by Scarface's stylist. However, a number of people have also since pointed out the costume's uncomfortable (and rather undeniable) resemblance to a caricatured Jewish stereotype, a fact that has drawn ire from all corners of the Internet. Personally, I don't know why we expected any less from a rapper whose "gay marriage anthem" began with what amounts to a full 45-second "no homo," but there you have it. That said, I would like to believe that Macklemore didn't intend to mock Jewish people with this outfit. He probably thought it was just a goofy costume, har har, and who doesn't love Tom Cruise in Tropic Thunder , right brah? Still, that blitheness is almost more infuriating, because it's yet another reminder of just how easy life can be for those whose accumulated check-boxes of societal advantage — white, wealthy, straight, male, etc. — make it possible to stroll through life without questioning or examining their behavior (until some op-ed writer points it out, that is). It's why fraternities have racist parties or Katy Perry performs in hackneyed Geisha drag. They're just, quite simply, oblivious, and that obliviousness reveals their privilege. Meanwhile, I'd like to give the prize of the day to Seth Rogen, whose perfectly cutting response sums up my feelings about the whole ordeal to a T.